Wilkerson Farm is a seasonal, organic farm located in Orem, Utah. Our mission is to help our local people live healthier and happier lives. We believe in good food and good fun. We grow with the seasons and have produce available from June through November each year. We specialize in root crops like potatoes, carrots, & beets but we also grow tomatoes, lettuce, peas, and more. For juicy fruits, we partner with other local farmers to offer berries, peaches, watermelon, and cherries. How can you get our produce? (1) Sign up for a CSA, which stands for Community Supported Agriculture. Its a way for you to partner with your local farm by paying in the spring for a share of the summer crop. We offer a weekly, biweekly, or monthly box option. (2) Order it online and pickup at the farm. Once our season starts, we will post what’s fresh and newly in-season each week. 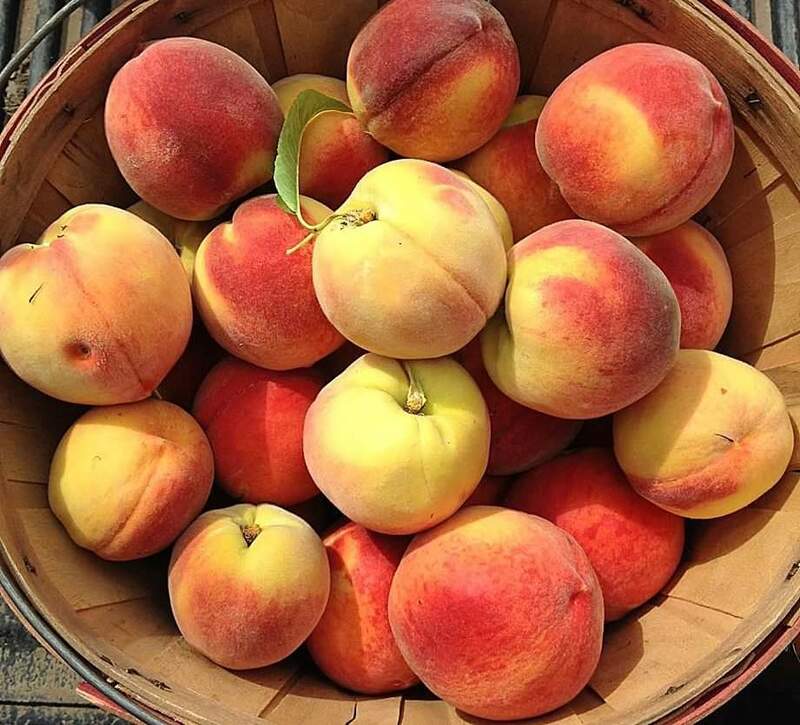 When peaches come on in mid-July, you can jump online and order a basket, a box, or a bushel! All orders will be available for pickup on Saturday in Orem. (3) Meet us at the farmers market every week. We will be at the Provo and SLC farmers markets every Saturday from June through October. For fun on the farm, we invite kids to come learn about farming at our summer day camp, June Days. We host smaller workshops, like fruit tree pruning flower arranging. We also celebrate the changes of the seasons with our annual Fall Fair, which includes a pumpkin patch and 5 acre corn maze. So come visit us! Knowledgeable, professional, locally owned farm. Such a great part of the community! We loved visiting. Have loved visiting this place. We bought the best watermelon here. It was delicious!! Will continue to come buy produce here. 🙂 the fall fair activities was fun too. Really good corn maze. Our family went to their pumpkin patch/corn maze and had a magical night! The staff was so friendly and accommodating! The rides were fun, the activities were great, and it was just the right size for our family to really enjoy without feeling overwhelmed and crowded! The grandchildren were in heaven and even my grown children had a ball! We left with a little pumpkin for each of the kids and everyone was thrilled! Thank you for providing a great night! Growing up as a boy in Canada, Richard loved climbing on all the old equipment of his dad’s 700 acre potato farm. He was devastated when the family had to leave the farm. In his teens and early twenties, he worked in construction, trucking, and roofing. But one stormy day, Richard fell off a roof and shattered his arm. He realized that if he was going to take risks, it would be for something he really loved. He started by leasing 3 acres and eventually his “farm experiment” turned into something much bigger. Rachel joined the team in 2014. She came to Utah for college from Orange County, CA. Farming is the last thing she (and her family) thought she would do. But it has proven to be exactly what she’s always wanted! This entry was posted in Farms and tagged csa, Fall Fair, farmers, fruit, organic, vegetables, wilkerson farm on March 22, 2019 .